Clearly, this very amateur photo was taken before tonight’s deluge, but it has still managed to create a storm of its own. It’s an O2 mobile phone mast. Dumped in the middle of Victoria Park, less than a minute’s walk from a toddlers’ playground. It’s been there since the beginning of July, powered by a noisy, fume-spewing diesel generator 24 hours a day, seven days a week. I asked Tower Hamlets council’s press office on Monday last week why it was there, what planning permission it had, what consultation there was with people who live around the park, and whether the council was charging a fee for it. Nine days later, the department run by the strangely comical £100,000-a-year Takki Sulaiman, sent me its response. Here it is: “Mobile providers sometimes look to install temporary masts to cope with the high usage of their networks during big events. 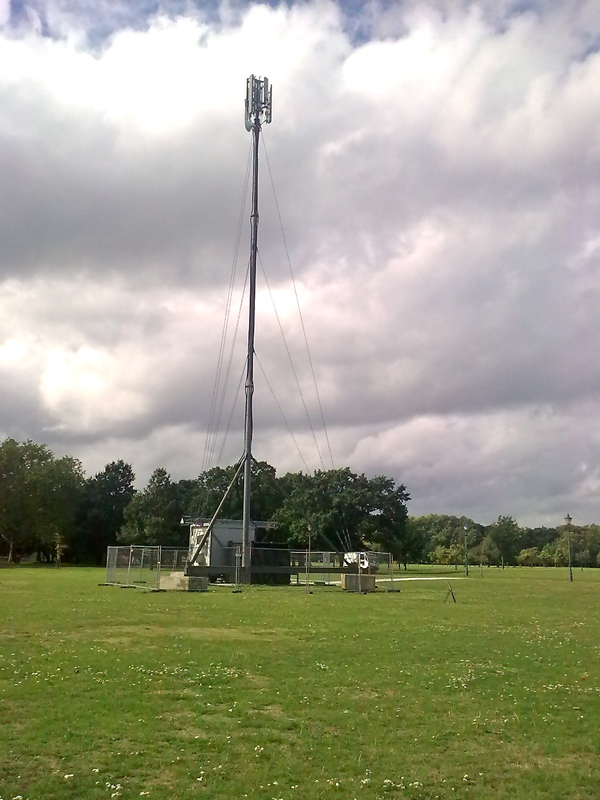 In this case O2 approached the council for a licence to erect a mast for Lovebox. As the mast was to be there for a temporary period no planning permission or consultation was required. For those of us who live in Tower Hamlets, Victoria Park is an absolute treasure, largely because it is so unspoilt. But over the last few years, people who live near it have grown increasingly fed up with how the council has exploited it over the summer months by hiring it out for festivals and gigs (personally, I think it’s good to show the borough off, but saturation point has now been reached). When residents protested about this last year, the council said it was listening. Only to then whore itself to O2 without asking any of those residents for their views. I’ve asked the council how much money it is charging O2. So far they’ve declined to say. And this is one case when councillors can’t be blamed because officers never even told them about it. They get £700,000 for the whole of the summer’s events. Personally, I’m glad I can make calls while the festivals are on, but I do think some of the money should be spent taking the elderly people of Bow on a weekend away, so that they can escape the noise. “Strangely comical” is about right. My sources tell me that when at the University of Warwick he threw an egg at Margaret Thatcher whilst she was on a visit. He missed. Victoria Park lies in E3. A search on E3 (see http://194.201.98.213/WAM/findCaseFile.do?postcode=E3&action322=Search)on the Council’s Planning Database reveals that no planning application had been logged and registered. It’s usual for ALL planning applications to require a period of public consultation. Presumably there were no notices advertising this to local residents in the local area either? Perhaps Takki Sulaiman would like to quote the reference number of the planning application, when it was received, when it was published on the database, which edition of East End Life it was highlighted in and where the consultation notices were posted. Or perhaps the organisers failed to consult with the Planning Officers? I think the point is that the council has admitted there was no consultation. They say that because the mast was “temporary” no consultation nor planning permission was needed. In essence, O2 asked the council and the council simply said yes. Takki Sulaiman’s press office is even refusing to say whether the council director responsible for the park, Stephen Halsey, signed off the permission. I suspect he didn’t. I think the decision was taken by some mid-ranking official, which itself is incredible. Sulaiman hasn’t even given an assurance that residents will be consulted before they erect the mast next year. I mean, why would he? After all, his £100,000 a year remit is “communications” not common sense. He lives in Haringey and he probably couldn’t care less for the park or for the people who use it. So maybe the answer is to ask Owen Whalley, Head of Planning and Development Control whether he agrees with the view that no planning application was required? Or has Takki Sulaiman now taken on the role of planning expert for the Council?